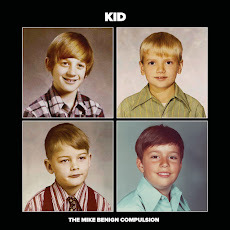 The Mike Benign Compulsion: Announcing the release date of our new album, "Kid"
Announcing the release date of our new album, "Kid"
The CD face for the new album. 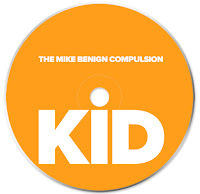 We're pleased to announce that the Mike Benign Compulsion's fourth album will be released on Tuesday, May 16th. Titled "Kid," the 11-track album will be released on CD and via digital download at Amazon, iTunes and our Bandcamp site. "Kid" was (mostly) recorded with Shane Hochstetler at Howl Street Recordings. Shane also mixed six of the songs, with Chicago-based guitar and production lord Danny Shaffer mixing the rest of the tracks. The album features guest appearances by our great, talented friends Brian Wooldridge (Compulsion Bassist Emeritus), Tyler Traband, Betty Blexrud-Strigens and Ed Spangenberg. Mark your calendars for our Friday May 19th CD release show. We'll have more details about that show soon.